Normally, this kulambu is prepared during rainy and winter days as we all know the medicinal facts abt ginger, yes, it really helps in digestion which we really need during those cold days . It is also good for people who has cold and to tell u the truth , this kulambu stays longer, i mean, for days.. Happy to share with u all..
Garlic pods -- 10 nos. Dry red chillies -- 4 to 5 nos. First roast the ingredients given in the table one by one and grind to fine paste. Soak the tamarind in the hot water for few minutes and squeeze the pulp. Chop the onions and tomatoes into cubes and make it ready. Heat the karahi with bot the oil and do the seasoning with vadagam else simply with mustard seeds and fenugreek seeds. Fry this and don burn while doing so. Add the curry leaves as well. Now drop in the chopped tomatoes, onions and scald well. Dump the garlic pods in the oil. Let the mixture gets half cooked in this oil. Add the ground paste and saute in this oil mixture. Cover and continue to cook in low flame util oil starts oozing out. Pour in the tamarind juice and add salt and turmeric powder. Combine well. Now, all u've to do is, cover again and cook in the low falme for 10 minutes. By the time, everything will be perfect and oil would be floating on the top. Switch off. Serve hot with rice.. This curry /kuzhambu tastes better the other day and is really good for digestion. Wow grt very new, slurpy and drooling. sounds soo good!...even if we have cough or cold!...i am sure it will clear the head up! 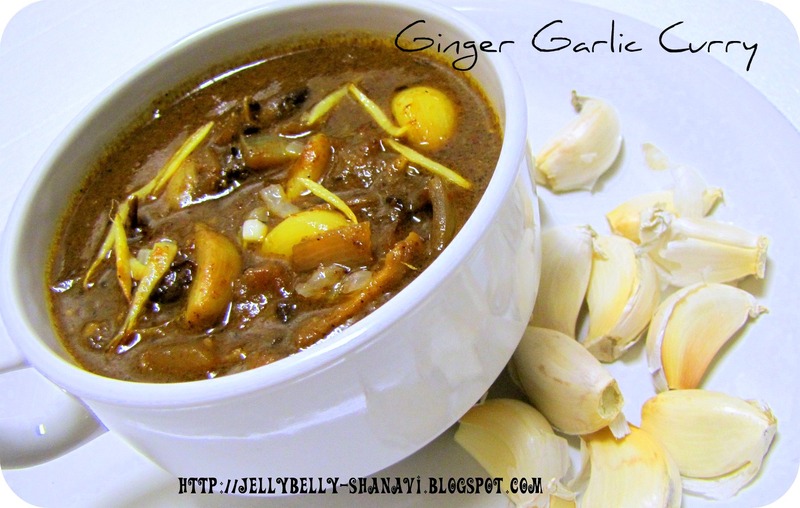 wow.. seems to be tomgue tickling.. in kerala we prepare ginger curry but combining ginger garlic is new for me.. will try this soon..
Inji poondu curry looks delicious. What a lovely recipe,It looks absolutely delicious..
Wow wonderful combo...very tempting click. Ginger and Garlic combi looks delicious. Very inviting. healthy curry!! !looks very thick and perfect with rice! Garlicky garlicky and i like it...The color is too good..